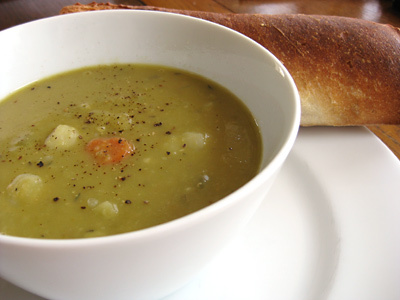 I’m a huge fan of pea soup on a chilly day. I make it slightly differently every time, but one thing I’ve learned is that a soup needs to be built up. When I was young, I would dump everything in the pot at once, turn up the heat and simmer, and wonder why it didn’t taste like it should. In this case, I started with the onions and gradually added ingredients until only the legumes, water and herbs remained to be added. I was happy with this particular version and thought I’d share it here. If you have time, brown the ham in the bottom of the soup pot in a little bit of olive oil, then remove to a bowl. Add a couple tbsp of olive oil in the bottom of your soup pot, and saute the onions, stirring occasionally, on medium-low heat until they are translucent and starting to carmelize. Add the carrots and cook for another 5 to 10 minutes minutes; add the potatoes and garlic (and the ham, if you didn’t brown it) and cook for another 5 minutes; add the celery and cook for another 5 minutes. During this process, stir occasionally because while a little browning on the bottom of the pan can add a nice flavor, you don’t want to go overboard and burn anything, which will ruin the soup. Stir in the ham. Add the water, herbs and 1/2 tsp of salt. Bring to a boil, stir the pot and lower the heat to a very gentle simmer. Most likely you’ll want more salt, but it is better to add and taste for salt in increments and there is plenty of time ahead. I’ll cook this for a few hours, stirring every once in a while, until the legumes have completely disintegrated. Towards the end of the cooking process, I’ll add in some freshly ground pepper to taste. This is marvelous served with some good bread, and maybe a garnish of fresh, chopped parsley on top. Emerging from winter always brings an interesting feeling of renewal. Just the other day, I was sadly mired in longing for real produce. Tomatoes so fresh they are a meal unto themselves. Opening the door to pick a handful of basil and thyme. The flood of zucchinis and Japanese eggplant. There is still quite a wait to reach those days, but at least yesterday we had deliciously warm weather. In an amusing dichotomy, the kids down the street had a snowball fight in short sleeves and shorts. As for me, I enjoyed an almost French stroll with my dog, walking into town and returning home with supplies from the butcher and the wine shop. If I was not baking my own bread these days, a baguette would have completed the picture. And some cheese. Really good cheese. And why do the carrots you find in French outdoor markets make our carrots look so pathetic? I digress. French markets do that. I was pleased to see that our butcher had made some fresh lamb merguez sausages, and that became our dinner. I threw together a country stew that was quick to make and complemented the full-bodied Spanish red I had picked up. This kind of meal is cozy and handy when time is short. You want to make sure you like the sausages, since they provide much of the flavor heavy-lifting in the stew. In a deep saute pan, heat up a splash of olive oil and brown the sausage meat, then remove to the side. Place a tablespoon of the oil back in the pan, and discard the rest. Saute the onions until translucent, then add in the tomatoes and cook for a couple of minutes. Add in the lentils, wine, water and sausage meat and simmer for 20 minutes. Stir in the spinach and continue to let simmer for 15 more minutes, or until the lentils are soft. If the stew starts looking too dry, add a little more water (you want it to finish moist but not soupy). Salt to taste — this will depend on the strength of the sausages. I served this with the wine and some thickly sliced bread, but if we had not been out of eggs, I would finished the stew off with two eggs baked on top (with a little ground pepper and a pinch of paprika on top, and the pot covered and on low heat). Apparently this is trendy now, but I ignore such things. I just think it would have tasted great. To see what I am talking about, check out We Are Never Full’s Eggs Cooked in Ragu. The blog has been pretty quiet lately because the evul-death111 cold/flu plague struck and struck hard, and I stopped cooking for a couple of weeks. It’s nice to be back! Of course, I warn you that we will probably disappear again for a bit, since kiddo #2 is expected literally any day now. Tick tock. I have totally forgotten what the first six months are like with a baby, which is nature’s way of encouraging humans to have more than one child. And if our English starts looking like we not only didn’t sleep, but also failed our first grade equivalency test, just blame it on that state of self-induced mania called parenthood. This soup was the first thing I made when it was clear that I was not going to turn into a zombie and spend the rest of my days lurking around malls and B-movies. It ended up being an interesting merge of a soup bubbling around in my brain and a recipe by Joy Manning posted on Serious Eats. 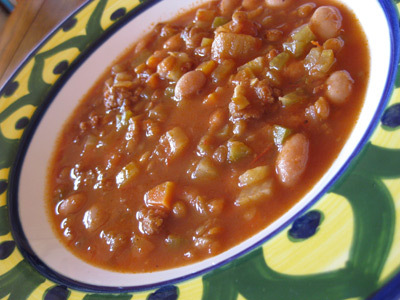 Soak the cranberry beans for several hours in cold water before starting the soup. Heat up a splash of olive oil in a large soup pot on medium-high heat and brown the smoked pork chop on both sides, then remove to a side plate. Place the ground pork into the pot, along with the fennel seeds, red pepper flakes, and 1/2 tsp of salt, and brown thoroughly. Remove to the plate with the pork chop. Lower the heat to medium and place the onions in the pot and cook until they start to turn translucent, stirring and scraping the bottom of the pot. Then add in the green pepper, carrots, celery, and fennel and cook for 20 minutes. Stir in the tomato paste and cook for another 5 minutes. Stir in the rest of the ingredients: cranberry beans, lentils, garlic, crushed tomatoes, pork chop and ground pork, parmesan rind, bay leaf, chicken stock and water. Bring to a boil and then reduce heat to a light simmer. Simmer for an hour or two and check the tenderness of the cranberry beans. Adjust for salt and pepper. Notes: if you want to thicken the soup, you can remove a couple ladle-fuls to a food processor and puree, then add back into the soup. I do not recommend using an immersion blender for this step, because you don’t want parts of the soup partially blended. 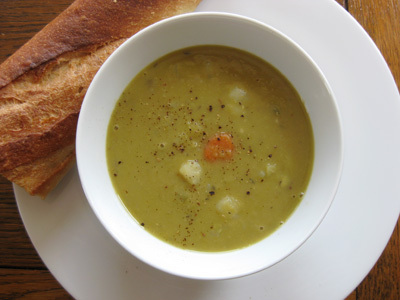 You can keep on cooking this soup for hours, and like most soups, it is really good the next day. I just ate it with some good bread, but you can also try it with a little olive oil or balsamic vinegar drizzled on top.